Comodo BackUp is a powerful and easy to use desktop application that helps home and business users protect their valuable data against damage or loss. The application's streamlined design and task orientated architecture means even novice users can learn how to create, run and restore their first backup job in a matter of minutes. Other features include full scheduling, password protection, a backup integrity checker and a range of preset backup jobs that allow you to quickly create copies of important data sets such as the Windows Registry, mail accounts and user settings. Comodo BackUp is also seamlessly integrated to Windows Explorer so that you can just select the folders or files you want to back up, right click on them and quick start the Back Up wizard. Quick backup of entire drives or individual files or folders to your local computer, network drive, FTP server or Comodo's online server. Step by step wizards to guide even novice users through the entire backup, restore and scheduling procedures. Flexible storage options allow you to specify full, incremental or differential backups. Protection of invaluable personal and business data from loss or corruption. Real-time backups synchronization feature to get your files copied over as soon as you save them. Built in checker to confirm the integrity of your backup files before committing to a restore. Backup presets including mail folders, windows registry, messenger archives and master boot records. Comodo Cloud - onlinefile storage service. Backup your files to a highly secure online storage which can also be mounted as a virtual drive in your system. Command line and scripting support to automate the online backup and restore operations. 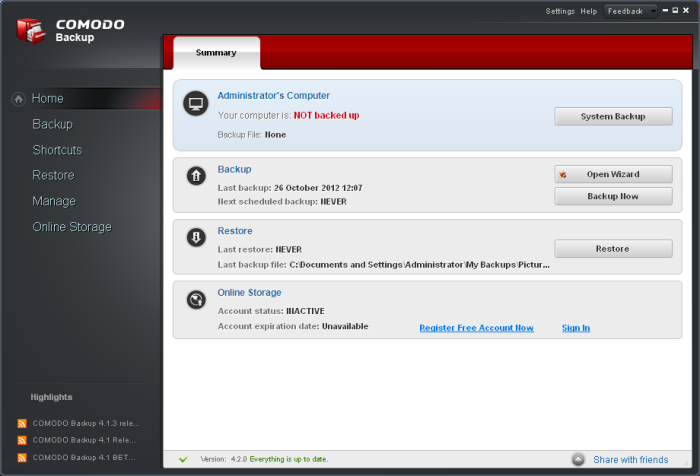 Comodo BackUp's streamlined interface provides fingertip access and control over all functional areas of the software. Please refer to the Comodo Backup online help guide at http://help.comodo.com/topic-9-1-455-4910-Comodo-BackUp-Introduction.html for more details on using the product.